A Beautiful Design that Brings European Charm. Based in Stourbridge, we offer our market-leading uPVC French casement windows throughout Worcestershire, Worcester, Redditch, Kidderminster, Bromsgrove, Droitwich Spa, Evesham, Birmingham, Coventry, Solihull, Wolverhampton, Dudley, Stafford and surrounding West Midlands areas. uPVC French casement windows echo their door counterparts with a dual opening design, allowing you to open each sash separately to control ventilation levels and accessibility. Due to their characteristic design, these windows feature a ‘flying mullion’ which removes the need for any static fixtures when the windows are open. This means that you’ll be able to enjoy a completely unrestricted opening, bringing unobstructed views and enhanced air flow to your home. Our uPVC French casement windows utilise the market-leading uPVC profile from Profile 22, which means that they stay true to the original French casement window design whilst offering modern standards of performance. Getting the right fit for your property sometimes requires that little extra touch, which is why we offer our uPVC French casement windows in two distinct profile options. You’ll be able to enjoy a window style that suits you. Chamfered: The chamfered profile offers a modern charm for your home, comprising a smooth and sleek appearance to catch the eye. This option is perfect for those looking to really enjoy all the benefits of the modern French windows. Sculpted: If you’re looking for a profile style that offers more of a traditional feel, the sculpted profile offers a more ornate feel that perfectly complements older homes. This options allow you to enjoy the best of the old and the new. By using the latest designs and techniques, our uPVC French casement windows allow you to bring a market-leading design to your home. You’ll be able to benefit from the outstanding thermal efficiency, security, durability, appearance and weatherproofing. These windows offer you a stylish way to enjoy a home that is safer and more comfortable. The multi-chambered profile design combines with innovative centre seals to protect you from the elements, achieving A++ Windows Energy Ratings. You won’t have to worry about draughts, leaks or water ingress ruining the look and lifespan of your windows or the comfort of your home. With this factor in place, you could also use your heating less frequently as warm air stays inside for longer. Further to this, their modern design allows them to become a worthwhile investment for your home. Due to their ergonomically shaped frames, and deeper drainage channels, our uPVC French casement windows require minimal maintenance to ensure they keep a fresh and new feel. This also means that they won’t rot, warp or crack over time. Offering exceptional security for your home, all of our uPVC French casement windows have achieved certification from Secured by Design. This means that they have undergone a stringent testing process from a police backed initiative, proving themselves as a home improvement solution that excels at keeping your home protected from any would-be intruders. We understand that environmental concerns have become more prominent in recent years, which is why we are dedicated to offering you home improvements that are both sustainable and eco-friendly. The uPVC profile that we use across our French window range is 100% recyclable, offering a renewable design that does not compromise on quality. Whether you’re looking for an eye-catching new addition to your home, or something that is a little bit more subtle, our range of colour options will give you something to suit. 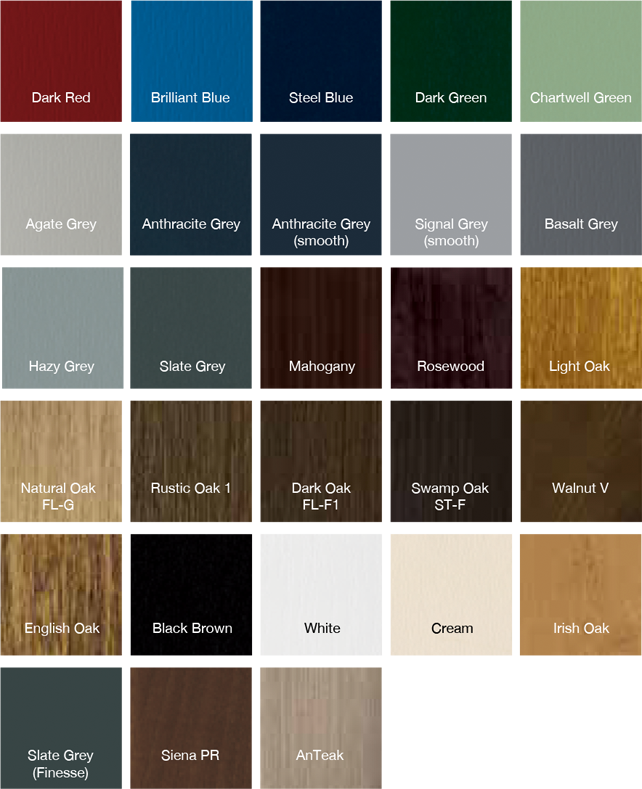 We offer a selection of standard colours and woodgrain foils to suit your tastes, all of which are applied with a highly durable coating to ensure they don’t flake, peel or discolour over time. Looking for French Casement Windows in Worcestershire and The West Midlands? Visit our online quoting engine today to get an instant, free and competitive uPVC French casement window quote. Our easy to use tool allows you to input your exact specifications, basing the price on your requirements to make things as cost-effective as possible for you. Alternatively, you can get in touch with us via our online contact form if you have any questions or would like to speak to a member of our team about getting a quote. We will be more than happy to help you find the right window for your home.